Read through the Gospels and you’ll find many instances of Jesus communicating with people. Pay careful attention and you’ll notice that He not only spoke to people but Jesus actively listened to them as well. 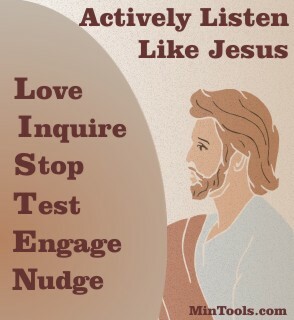 The following acrostic of the word LISTEN pulls out some of the key elements of active listening demonstrated by Jesus. Jesus listened without prejudice. We can especially see this in His interaction with the woman at the well (Jn. 4:4-42). Despite culture, gender, racial, and moral strikes against her, Jesus lovingly interacted with her … both listening and talking. Love must motivate and envelope the way we listen for Jesus Himself said, “Love one another. As I have loved you, so you must love one another” (Jn. 13:34). Jesus often asked people questions, a sign of someone truly listening. Jesus obviously knew their answers but listened due to the effect it had on the person not just for His own benefit, like when He asked the blind beggar calling out to Him what he wanted Jesus to do for him (Mk. 10:46-52) and the lame man if he wanted to get well (Jn. 5:5-9). Sometimes He would ask the disciples, “What do you think?” (Matt. 17:25) or “Who do you say I am?” (Matt. 16:13-16). After His resurrection, on the road to Emmaus, Jesus asked questions and then listened to their interpretation of events before explaining the reality of what happened (Lk. 24:15-27). As leaders, we too need to ask people questions and then actively listen to their concerns, opinions, and needs. Like Jesus, we should want to take people to higher levels in their thinking which sometimes only comes as we hear them out where they are. Jesus didn’t let busyness keep Him from listening. He took the time to stop and listen even when en route, like on His way to heal Jairus’ daughter when He stopped to listen to the story of the woman who touched his garment (Mk. 5:22-34). Availability must mark church leaders who want a Christ-like ministry. No matter how busy we may be, people matter. Taking the time to stop and listen, even if for a brief encounter, communicates volumes in terms of the value we place on people. Jesus patiently drew out what was inside people. Think of how the woman at the well felt safe to keep sharing with Jesus (Jn. 4:4-42) because He didn’t rush her but patiently drew her out. To actively listen as Jesus did, we too need to remember that “The purposes of a person’s heart are deep waters, but one who has insight draws them out” (Prov. 20:5). We need to test the water, so to speak, waiting for a person’s readiness. Sometimes their first response isn’t the real answer and we need to simply keep inquiring and keep listening until they get to the core. Jesus stayed in the moment as He ministered to people. Nowhere do we read of His mind wandering on to all He had to do or Him interrupting people while they spoke to Him. He looked at people. He touched people. He let them know that they mattered. Jesus knew the value of listening. Not only did He actively listen to people but He also demonstrated a life of listening to His heavenly Father (Mk. 1:35). So, when He nudged people to also listen (Matt. 15:10; Lk. 8:18), He knew what He was asking of them. In this Practicum we’ve previously stressed the critical nature of listening in fulfilling our church purpose and living out God’s design for Body Life. It not only helps us get people on board but also enables us to better meet needs and hence make disciples. Certainly as church leaders, we must show how to actively listen through our own example in following Christ (1 Pet. 5:3) but sometimes, like Jesus, we too must give people a little nudge, reminding them of their need to first and foremost listen to the Lord and also to listen to one another. ← Previous Previous post: Job Descriptions as Tools of the Holy Spirit?